Few people know that this is actually true, although not as dramatic as you would picture in your mind. It’s all about a special enzyme present in pineapple: bromelain. Bromelain is the general name for a group of enzymes present in the stem, leaves, and fruit of pineapple. In terms of chemistry, bromelain is a protease, meaning it breaks down proteins. In other words, that saying about “the pineapple eating you” is true. When you eat pineapple, the bromelain present in its juice and pulp starts breaking down the proteins of your mouth’s tissues. Dissolving your tongue and cheeks, basically. This is why you get that stinging feeling when you eat pineapple—and why you can get a sore mouth if you eat a lot of it. Don’t worry though, this effect won’t be enough to cause any serious damage, just a fun fact to know! Although the term ”bromelain” is relatively new (just a bit over 100 years old), the natives of South and Central America have been reaping its benefits it for centuries on end. And it’s widely used now too! For example, grilled pineapple is a popular side dish served in the middle of all-you-can-eat feasts in Latin America (like the famous Brazilian rodizio). Thanks to bromelain, this helps to clean the palate (basically, to break down the remaining bits of food) and aid in the digestion of meat. Speaking of meat, pineapple juice is a traditional meat tenderizer—and this is also due to the action of bromelain. By breaking down part of the proteins in meat, it makes meat softer. If meat is your thing, try adding a bit of fresh pineapple juice to your favorite marinade and see the effect! But, don’t think of bromelain just as a meat tenderizer: it has many healing properties too. Any kind of inflammation is always based (among other things) on the action of an enzyme known as cyclooxygenase-2 (COX-2), which produces important inflammation markers like prostaglandins. Bromelain can significantly suppress inflammation by blocking this COX-2 enzyme. Just as conventional drugs such as ibuprofen and aspirin—but without the toxic side effects! A study shows that a mix of bromelain, trypsin (an enzyme synthesized in the pancreas), and rutin (a flavonoid abundant in capers, olives, buckwheat, asparagus, many citruses, and natural sources) has been proven to be effective for reducing inflammation in 103 osteoarthritis patients. 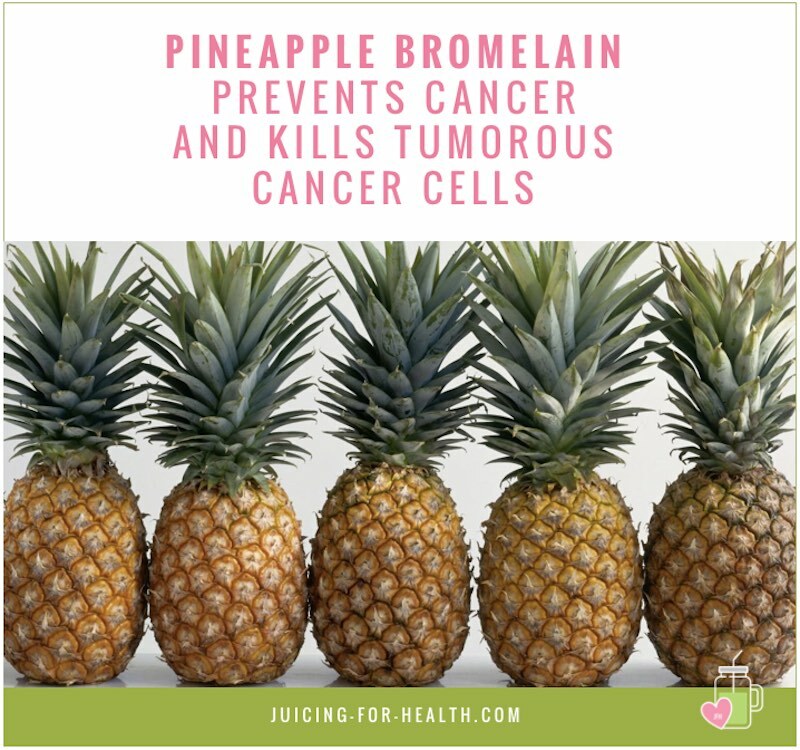 Bromelain can boost your body’s self-defence system by activating the lymphocytes, macrophages and monocytes. These immune cells kill the viruses and bacteria that enter the body, modulate inflammation, and even kill cancer cells. Bromelain is known to lower platelet count and activity, as well as dissolve existing blood clots. This effect is extremely valuable for people who had suffered from a stroke or a heart attack in the past, people with unhealthy habits (smoking being the most serious of them), and people with a history of heart diseases in their family. It seems that bromelain is able to prevent some bacteria such as Escherichia coli (E.coli) from attaching to the lining of the intestines and causing diarrhea. This effect isn’t universal, but will work great with certain bacteria. Bromelain has a double action against excess weight: it prevents new fat cells (adipocytes) from being accumulated AND it kills existing fat cells, especially when paired with all-trans retinoic acid (ATRA), an active metabolite of vitamin A. Thanks to its anti-inflammatory properties, bromelain can significantly relieve the unpleasant sensations after surgical teeth removal in about 70% of cases. In general, this helped to speed up recovery after the operation as well, not just make it more bearable. A research showed that raw extracts from pineapple has the ability to decrease mucus five times faster than over-the-counter cough syrup. In the study, participating patients recover 4.8 times faster. If you’ve been following this site, you know that I always recommend using a slow juicer for juice extraction. A slow juicer is best for extracting pineapple juice as you get the maximum yield, absolutely concentrated and enhanced juice quality with all its nutrients still intact. Some people juice the entire pineapple with its skin. I do not recommend including the skin as the rough skin can harbour dirt that cannot be removed by washing. To prepare pineapple, first cut off its “crown” and the bottom. Keeping the fruit upright, then start cutting off the skin with a sharp knife. Once you have cut off all the skin, cut the fruit into smaller pieces so that you can easily put them through your juicer. Do not discard the pineapple core as it contains the highest amount of bromelain. Put the core through your juicer as well, to extract its juice. To make pineapple juice for therapeutic consumption, use a whole pineapple, preparing it as described above. Once you have extracted the juice, add ¼ teaspoon sea salt to cut the acidity and serve. 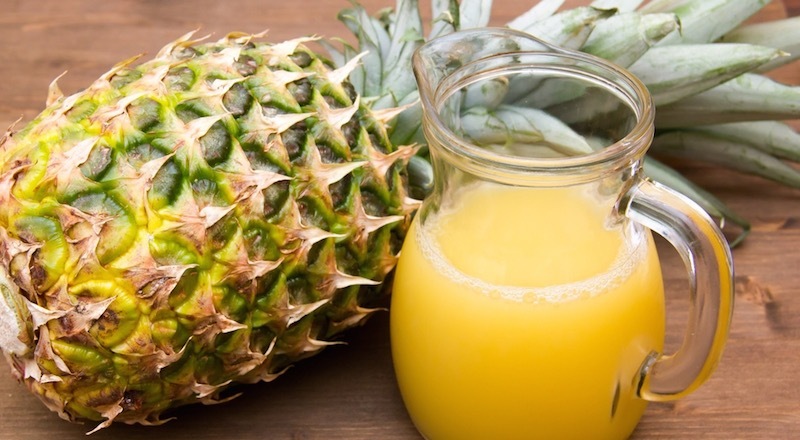 Drink pineapple juice only for a season, such as to reduce pain, inflammation and for an internal injury. Use a straw if you find that the juice makes your mouth sore. For making a natural cough syrup, prepare the juice as described, add ¼ teaspoon sea salt and 1 teaspoon of raw honey. Stir and dissolve these in the pineapple juice. You can store the juice in the fridge, but leave it out to warm to room temperature before drinking. Never drink cold drinks when you have a cough. If juicing pineapple and drinking its juice is not your thing, you can still benefit from pineapple bromelain by taking it in supplement form. Bromelain supplement comes in handy when you’re in pain and not able to juice! It is a great anti-inflammatory and a natural painkiller. Make sure to buy bromelain supplement only from reputable companies. For dosage, always check the manufacturer’s recommended doses as there may be additional components in the blend. NOW bromelain is a good one that I recommend. As you see, the power of bromelain is absolutely amazing—but how safe it is? I mean, if it’s a digestive enzyme, is it possible to take too much of it and mess up something? It seems that bromelain is fairly safe to take even at large daily doses for a long time. For example, an old study back from 1997 reported that even such huge doses like 12 grams of bromelain per day do not lead to any kind of toxicity whatsoever. There is no point in taking THAT much of bromelain for any health condition, but the point here is that you can be absolutely sure of its safety.